A delicious squash casserole recipe made with herb stuffing, sour cream and cream of chicken soup. The FIRST thing I have to tell you about this recipe is that you should NOT judge it by this terrible picture! I quickly snapped this at Thanksgiving one year and the picture DOES NOT do this recipe justice! I'll post a photo of my Chicken & Stuffing Casserole below which is basically this same recipe but with chicken instead of squash and you can get a better idea of how gorgeous it really is! I love this recipe so much that I used it to create a main dish casserole using chicken instead of squash (pictured below). This will give you a better idea of what the squash casserole looks like when the camera is being nice! I've had lots of squash casseroles over the years (some with cheese, some with mayo, some with crackers, etc) but none of them even comes close to this one! Mama's been making this longer than I've been alive and it is MY FAVORITE casserole recipe ever! If casseroles aren't your thing, here's a beautiful recipe for Fried Squash too! Every Southern kitchen should know the sound of grease popping around a skillet of squash getting fried! Zucchini Pie - Sauteed zucchini and onions with Italian herds and cheese baked in a crescent roll crust. Sweet Potato Praline Casserole - A classic recipe with whipped sweet potatoes crowned with a pecan praline topping. 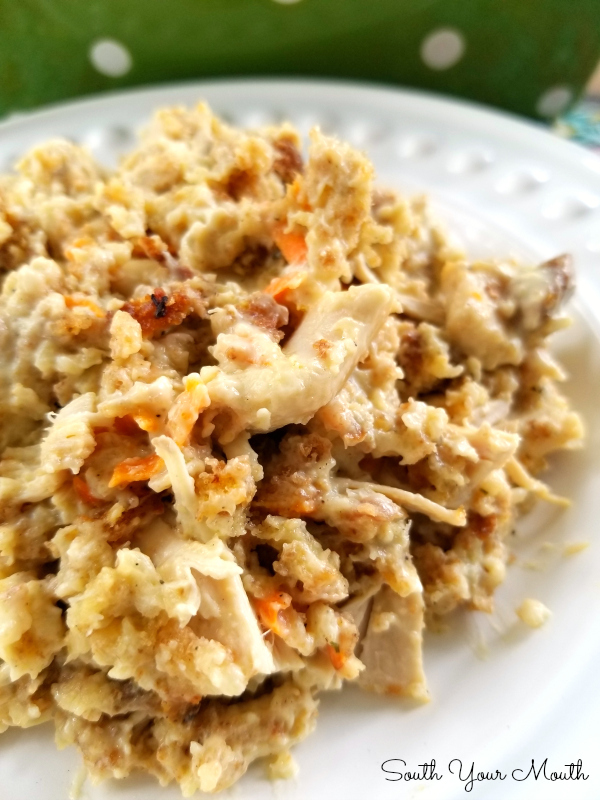 Mama's Cornbread Dressing - Southern cornbread dressing made with cornbread and herb stuffing that everyone will love. 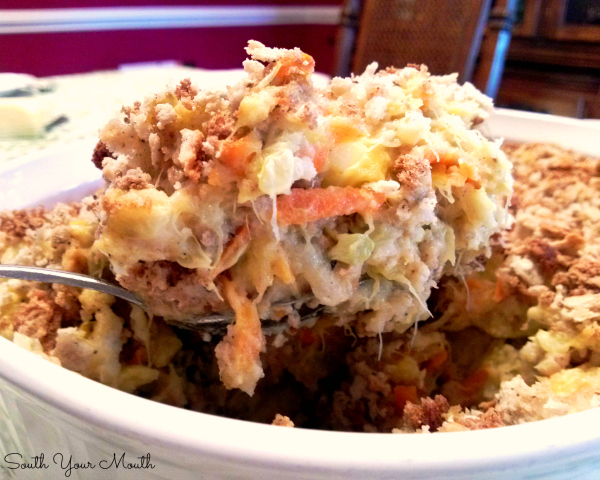 Southern Cornbread Dressing with Sausage - Much like Mama's recipe for dressing but with sausage! Southern-Style Green Beans & Potatoes - Green Beans & Potatoes cooked low and slow (both stove-top and crock pot instructions). Southern-Style Collard Greens - A step-by-step recipe for cooking authentic Southern collard greens. Corn Casserole with Cheese & Bacon - An easy casserole recipe with corn, butter, cheddar cheese, bacon, a little flour, eggs and chives! Pineapple Casserole - A sweet, savory, Southern casserole with pineapple, buttery Ritz crackers and sharp cheddar cheese. Country-Style Baby Lima Beans - A no-fail Southern recipe for tender baby lima beans (butterbeans) cooked low and slow with bacon. Boil squash with salt and pepper until tender then drain well and add to a large bowl. Add onion, carrot, cream of chicken soup, sour cream and butter and mix well. Fold in 2 cups of the stuffing. Add mixture to a baking dish then top with remaining stuffing. Bake at 350 degrees for 30-40 minutes or until golden brown and bubbly. I'm with you. I don't care for casseroles either. It's probably why I'm no longer in my parent's will. But this has cream of whatever soup in it...? I am in LOVE with everything on this blog! Thanks for sharing! LOL! Thanks! You just made my day! 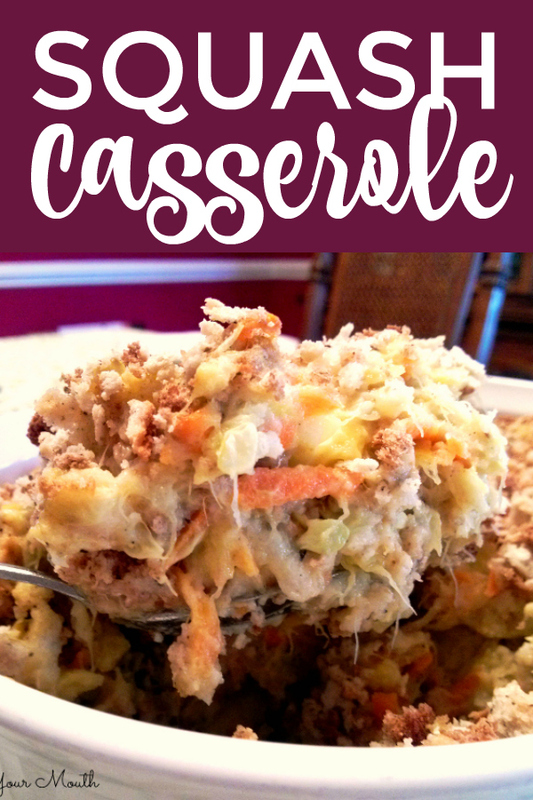 This is the best squash casserole..because I have had it and I have made it and sometimes canned soups are a good thing for crying out loud...BTW..your recipes are wonderful!! This sounds and looks AWESOME. Thanks, Cheri! And it's OK... don't tell anybody but... butter beans aren't my favorite. Unless they've been cooked ALL DANG DAY or they're the dried kind. Thanks for you comment! My mom's been making this one for years! Yep, it's yummy! I cant wait to try this. I make a chicken casserole with the same things minus the stuffing & using cream of mushroom instead of chicken. I have found that to make recipes that do call for cream of anything, if you heat on the stovetop first before adding to rest of ingredients it takes the "canned" taste away! Made this last night & it was so delicious!! Hubby loved it. I did a few changes, like sauteing the onions & squash in the butter and using cream of mushroom. Everything else the same. This is my new favorite squash casserole! I froze half of it before baking, hope it freezes well. I have a really good one that is low carb. Minus the soup and you add mayo and cheese and bell pepper. You can top it with the stuffing mix or cheese. Since I cannot have the carbs I use the cheese and it is yummy. I use cream of celery soup now, I think it gives it a better flavor. This is my favorite way to eat squash. I also mix yellow and zucchini squash. This sounds great,printing it off now.This squash casserole and some Louisiana green beans with corn bread.A great summer meal.My Mom always cooked squash when we were growing up,she made stewed squash,(just squash,onion and when tender add an egg and scramble in) . Ok, I don't want to sound super blonde or anything, but do you prepare the stuffing before hand or does it go in dried? I'm up in Canada and we don't get the Pepperidge Farm stuffing here. We have Stove-Top stuffing that is dried, then you mix it with water. Sounds good though. LOL, you mix it in dry :) I think you could use Stove Top. It'll have more seasoning in it than the PF but I think that ought to be OK.
Let me know if you try it. We may be up for Canadian Thanksgiving this year which means I'll do some cooking and I need to think about what I need to bring with me (I use a little PF in my cornbread dressing too)! Can't you see me explaining to the border police WHY I need to bring 40 pounds of stuffing into the country?? Used similar recipe for years. Also delicious. .cook 1 pk of Jiffy cornbread to crumble instead of stuffing. I also don't boil the squash. I saute the onion in margarine, add sliced squash, cook until tender and drain. Blend cream of chicken & sour cream with spoon, add all to casserole dish..I never used carrots but sounds good. Bake until bubbly. Top with crumbled corn bread and bake until slighty brown. Just picked some fresh squash yesterday from the garden. Can't wait to try this! Im from NC. I love squash casserole....but only the way my nannie makes it. She stews her squash and onions. Then drains well. She adds sour cream, sharp cheddar cheese, and an egg, I think. Then she tops it with crushed ritz crackers or cheese nips. Soooo yummy! Channeling Forrest Gump for just a second there, I see? Made me laugh and I also pinned this one. I pin almost every one. "Let me tell you, yes, I am fat but I enjoyed every bite of it." This looks fantastic! Can you tell me what size casserole dish and how many does this serve? There is only two of us and I have an awfully small fridge! My name is Claire and I am from Ventura, CA but I could only publish as anonymous. Thanks! I think I usually use my 2-quart casserole dish when I make this. I have used cream of celery soup and it is just as good if not better. This is the recipe my Mom has always used! It is delicious! Has anyone ever made it with zucchini instead of yellow squash? I have 10 lbs I need to use up. I HAVE BEEN MAKING THIS FOR YEARS. FIRST HAD IT AT THE KNICKERBOCKER GOLF COURSE CINCINATUS, NY. IT IS SO GOOD! YOU WON'T BELIEVE YOU MOUTH! LOL! ENJOY! We pulled this out of an old church cookbook some years back and my stepmom does it most holidays. I believe we usually use cornbread dressing mix, though. I shred zucchini, onion, & carrot and freeze it in the summer for use in this casserole in the winter. I mix the entire box of dry stuffing with the other ingredients and bake. Top with your choice of cheese towards the end of baking time. Yummy! I also use cream of celery soup if I don't have any cream of chicken on hand. Also, I've been known to eat the leftover casserole cold straight from the fridge. Just like my Momma makes! Yummo! No cheese at all in this? Looks like there is cheese. I have never made a squash casserole, but going to try this for sure! I live in SC too, near Columbia, and I love following you! So enjoyable! I'm not from SC but I am a south Georgia girl and I love love love your blog! I've been making this for about 20 years..I use Stove Top Herb Stuffing mix and diced the squash, instead of slicing. I make this for both sides of my family every Thanksgiving. I have three dishes I am required to bring every year. Haha. I use Margaret Holmes squash with Vidalia onions just because I don't have much time. I also use cornbread stuffing mix, cream of mushroom soup, mayo, an egg and shredded sharp cheddar cheese.